(File Photo) Avy Powell-Qualo cleared 5'4" to win the high jump title in the large school division. 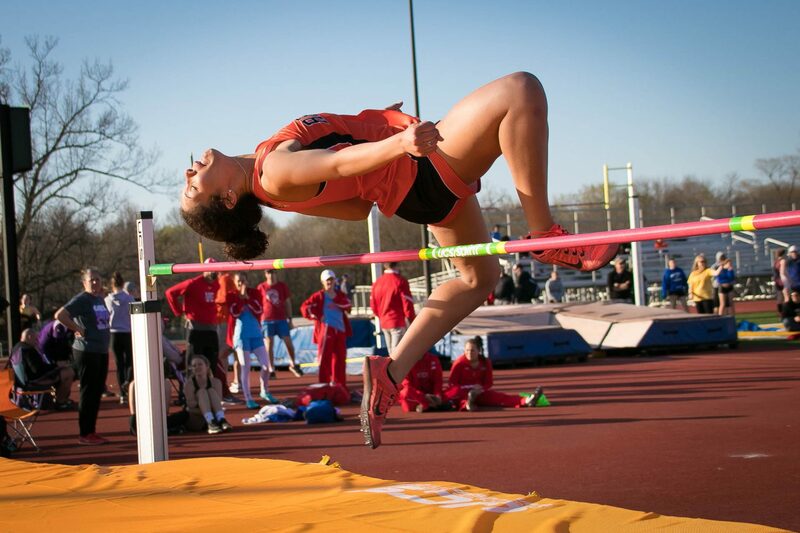 Avy Powell-Qualo won the large-school division in high jump to lead several strong performances at the Southwest Baptist University Invitational track meet Tuesday. Powell-Qualo cleared 5’4″ to beat the rest of the field. Jasmyn Douglas finished second in the 400-meter dash, Skyler Owen finished third in the 200-meter dash, and Jake Jones was fourth in the long jump. The top relay finish for Republic was the 4×100 relay (Dylan Brown, Cam Flood, Jake Jones, and Skyler Owen), who took third place. Several other top Republic finishers are listed below. You can follow this link to see full results from the meet. The 4×800 relay team of Jazzy Kirby, Chloe Burton, Morgan McGuire, and Jade Kirby finished sixth, with a time of 10:16.89. The 4×100 relay team of Delaney Smith, Kaitlyn Ragsdale, Jasmyn Douglas, and Avy Powell-Qualo finished eighth. The 4×400 relay team of Delaney Smith, Lawson Tunnell, Avy Powell-Qualo, and Jasmyn Douglas finished seventh, with a time of 4:16.42. Jean Carlo Marin Barrantes finished sixth in the pole vault, clearing 10 feet. Jake Jones was fourth in the long jump, with a distance of 19’10.5″. Cam Flood finished seventh in the triple jump, with a distance of 40’8.5″. The 4×200 relay team of Jaden Appleberry, Dylan Brown, Cam Flood, and Andrew Liedtke finished fourth with a time of 1:33.57. The 4×100 relay team of Dylan Brown, Cam Flood, Jake Jones, and Skyler Owen finished third with a time of 44.24. Skyler Owen finished third in the 200-meter dash with a time of 22.45. Dylan Brown was ninth, at 23.43. Owen was disqualified for a false start in the finals of the 100-meter dash, where he’d posted the fastest time of anyone in the field coming into the meet.